The Traction Table Knee Bolster Set is a durable aid for clinical or home use. Featuring independent bolsters to support each leg, this set is a fully functional, easy to use accessory. Constructed from precision cut, high quality foam and encased in an easy to clean vinyl cover, it also features positioning straps on each bolster to provide easy repositioning. The Traction Table Knee Bolster Set provides positioning at a height of 7" or 10.5" to ensure patient comfort during supine traction. 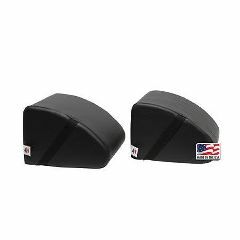 For traction or positioning in the prone position, the 7" height is ideal for supporting and elevating the ankles to reduce tension in the hamstrings.